The downside of query string removal in WordPress can be easily overcome by managing your cache, which will be further explained in this WordPress optimization guide. There are a few ways to effectively remove query strings from static resources in WordPress. 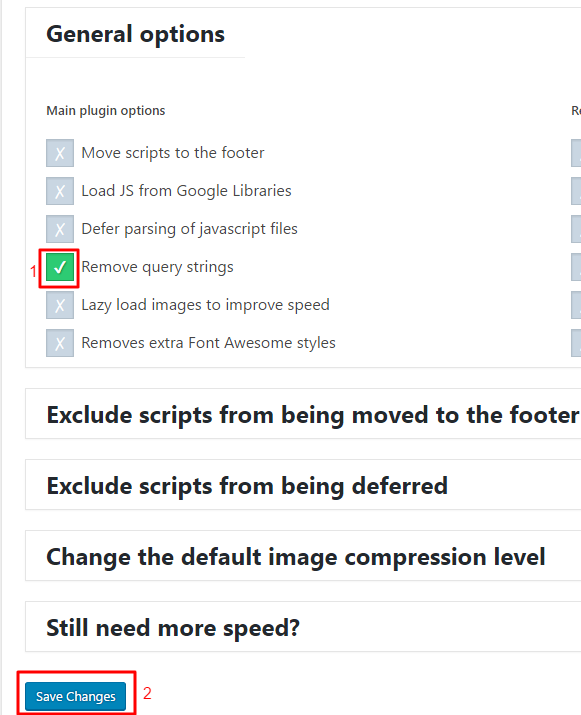 After implementing Speed Booster Pack to WordPress, navigate to the Settings of the plugin. It is also possible to use plugins such as Remove Query Strings From Static Resources or Query Strings Remover to reach the same goal. IMPORTANT! Make sure to have a backup of functions.php file before making any changes. In some cases (depending on your WordPress configuration) this code can cause 500 Internal Server Error. In that case, the plug-ins from Step 1 will do the trick. Proper management of WordPress cache will allow you to deliver the latest files to all visitors without causing any issues. If you are using WordPress caching plugins, you will simply need to clear your WordPress cache after making a change. Same goes if you implemented browser caching for your WordPress site, clearing the browser cache will let you see the latest changes. These few tricks will let you counter the small disadvantage that removing query strings from static resources in WordPress may cause. THanks guys, speed Booster plugin gave me error last time.